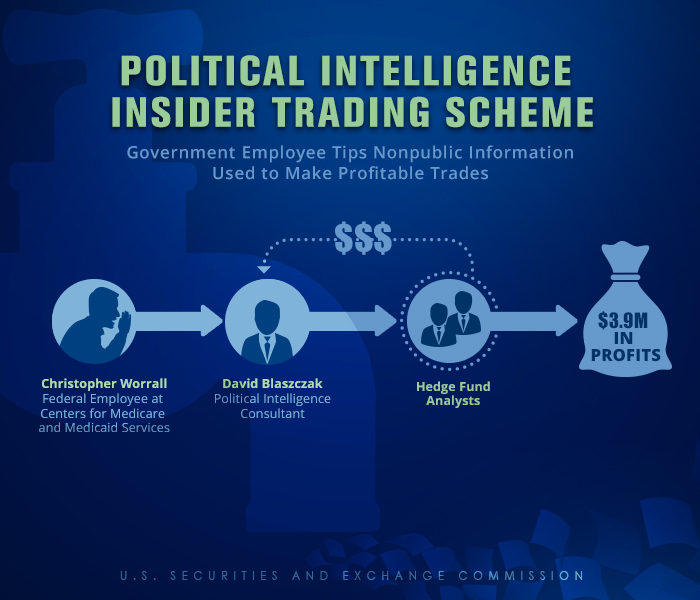 Washington D.C — The Securities and Exchange Commission today announced charges in an alleged insider trading scheme involving tips of nonpublic information about government plans to cut Medicare reimbursement rates, which affected the stock prices of certain publicly traded medical providers or suppliers. The SEC’s complaint alleges that David Blaszczak, a former government employee turned political intelligence consultant, obtained key confidential details about upcoming decisions by the Centers for Medicare and Medicaid Services (CMS) from his close friend and former colleague at the agency, Christopher Worrall. According to the SEC’s complaint, Worrall serves as a health insurance specialist in the Center for Medicare and tipped Blaszczak about at least three pending CMS decisions that affected the amount of money that companies receive from Medicare to provide services or products related to cancer treatments or kidney dialysis. Blaszczak allegedly tipped two analysts at a hedge fund advisory firm that paid him as a consultant. The analysts, Theodore Huber and Jordan Fogel, allegedly used the nonpublic information to recommend that the firm trade in the stocks of four health care companies whose stock prices would likely be affected by the decisions once CMS announced them publicly. The alleged scheme resulted in more than $3.9 million in illicit profits. According to the SEC’s complaint, Blaszczak’s firms were paid at least $193,000 in a 19-month period by the hedge fund where the analysts worked. “We remain committed to using all resources available to detect sophisticated schemes and stop those who try to create a revenue stream by tipping or trading on material, nonpublic information,” said Robert A. Cohen, Co-Chief of the SEC Enforcement Division’s Market Abuse Unit. The SEC’s complaint, filed in U.S. District Court for the Southern District of New York, charges Blaszczak, Worrall, Huber, and Fogel with violating Section 10(b) of the Securities Exchange Act of 1934 and Rule 10b-5 as well as Section 17(a) of the Securities Act of 1933. The complaint seeks disgorgement of ill-gotten gains plus interest, penalties, and permanent injunctions. In a parallel action, the U.S. Attorney’s Office for the Southern District of New York today announced related criminal charges. The SEC’s investigation, which is continuing, has been conducted by Ann Rosenfield, Patrick McCluskey, and Carolyn Welshhans in the Market Abuse Unit. The case has been supervised by Mr. Cohen. The litigation will be led by Gregory Bockin and A. Kristina Littman and supervised by Cheryl Crumpton. The SEC appreciates the assistance of the U.S. Attorney’s Office for the Southern District of New York, the Federal Bureau of Investigation, and the Department of Health and Human Services Office of Inspector General.